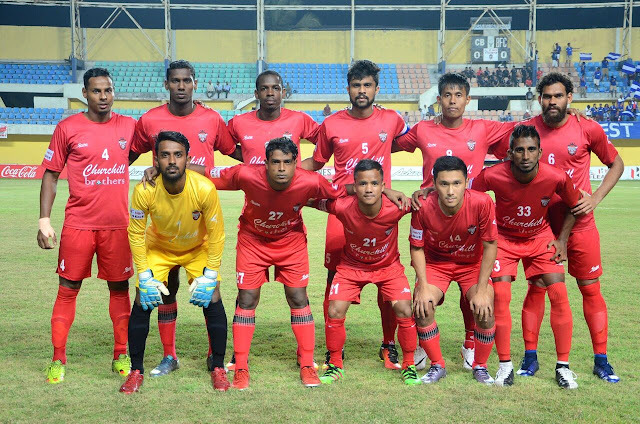 Bengaluru FC's title aspirations took a major hit yet again after they lost their second game in trot, this time losing 2-1 to Churchill Brothers in Goa. Anthony Wolfe and Chesterpaul Lyngdoh scored one goal a piece after Sunil Chhetri had give Bengaluru FC the lead from the spot in the first half. In the 22nd minute, Roby Norales was bundled over inside the box by Fulganco Cardozo as the referee pointed to the spot. Bengaluru FC skipper Sunil Chhetri calmly converted the resulting penalty. Churchill did not let the lead stay for much time as Anthony Wolfe managed to get himself ahead of the onrushing Amrinder after being fed by Chesterpoul Lyngdoh. The provider turned scorer in the 53rd minute as Chesterpoul Lyngdoh provided a carismatic finish to chip the ball past Amrinder. Bengaluru FC were handed a huge blow in the final few minutes of the match as their center half John Johnson was given a straight red after a reckless lunge on Richard Costa. Bengaluru FC stay in 4th spot with 9 points while Churchill Brothers SC move to 7th spot with 4 points from their quota of 5 matches.